Oahu Snorkeling at the Bay: Hanauma Bay + Waimea Bay :: oahu hawaii. oahu beaches. 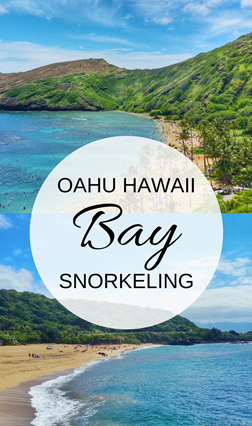 So you’ve started to look into snorkeling in Oahu, and you know that there’s this one really famous bay that’s good for snorkeling that you keep hearing about. But, you can’t remember… what is the name of that bay?! So, which bay for snorkeling on Oahu? The bay on Oahu that’s more popular for snorkeling is Hanauma Bay. This is one of the 3 areas on Oahu in which marine life is protected. Around this area of Waikiki and around this area of the North Shore are the other areas, also good spots for snorkeling in Oahu. There is an entry fee to Hanauma Bay, and you can also rent snorkel gear at Hanauma Bay too. If you want to get in more activity on the day you go snorkeling at Hanauma Bay, the Koko Head hike is right nearby. Koko Head is a strenuous hike, so you should have decent fitness for doing this hike. But then, snorkeling at the bay can make for a perfect post-hike activity! Another trail is Makapuu Lighthouse Trail that’s down the road, which you may want to put high on your priority list if you are in Oahu during whale season. If you’re not going on a dedicated whale tour, this paved trail could be one of your best chances to see whales in Oahu. It’s not as difficult as the Koko Head hike, but since it is an uphill trail to get to the end of the trail (it’s an out-and-back hike), it would be a good idea to have decent fitness for the Makapuu Lighthouse Trail as well. The North Shore of Oahu is best known for its high surf during surfing season which is at its peak during the winter months. Outside of surfing season when the waves are calmer, it can make for some good snorkeling. And this includes Waimea Bay. This bay is one of the popular beaches on the North Shore. If you choose not to bring snorkel gear to Hawaii, you can rent snorkel gear nearby at Shark’s Cove. 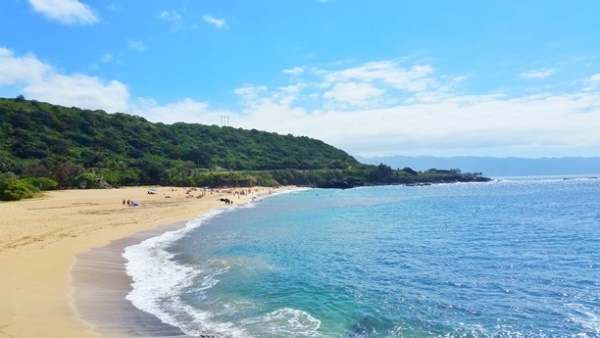 There is free parking at Waimea Bay Beach Park. If you arrive to find a full parking lot, nearby Waimea Valley has parking. Of course, it wouldn’t be such a bad idea to actually visit the grounds of Waimea Valley if you do this. 😉 Here you will find a botanical garden with a variety of plants, a paved trail taking you to waterfalls, and an ancient Hawaiian living site. There is a fee to enter the attractions of Waimea Valley, but not the parking lot, at last check. See pictures of Waimea Valley attractions here. It will be a little bit of a walk (maybe about 10 minutes or so), and you will have to cross the main road to go from Waimea Valley to Waimea Bay, so be careful if you do this. Now, here are some things you just may want to consider adding to your Hawaii packing list so you’re ready for the sun when you’re snorkeling in Oahu! For a more in-depth look at what to bring snorkeling in Oahu, have a look at what to wear snorkeling! HAPPY BAY SNORKELING IN OAHU!